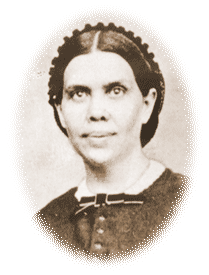 Ellen G. White was a co-founder of the Seventh-day Adventist Church along with her husband James and close friend Joseph Bates. Mrs. White is also known as a messenger from God. She was born Ellen Gould Harmon in Gorham, Maine, November 26, 1827, to Robert and Eunice Harmon. She and her twin sister Elizabeth were the youngest of eight children. When Ellen was in her early teens she and her family accepted the Bible interpretations of the Baptist farmer-turned-preacher, William Miller. Along with Miller and 50,000 other Ad-ventists, she suffered bitter disappointment when Christ did not return on October 22, 1844, the date marking the end of the 2300-day prophecy of Daniel 8. In December 1844 God gave young Ellen the first of an estimated 2,000 visions and dreams. In August 1846 she married James White, a 25-year-old Adventist minister who shared her conviction that God had called her to do the work of a prophet. Soon after their marriage the Whites began to keep the seventh-day Sabbath according to the fourth commandment. The mother of four boys, Mrs. White suffered the pain of losing two of her sons. Herbert died as an infant a few weeks old, and Henry died at 16. Her other two sons, Edson and William, both became Adventist ministers. Ellen White was a prolific writer, with a total literary output of 100,000 pages. Her first book was published in 1851. She wrote a steady stream of articles, books, and pamphlets until her death in 1915. Of her scores of books, some are devotional in nature, while others are selections from the many personal letters of counsel she wrote over the years. Still others are historical and trace the ongoing struggle between Christ and Satan for control of individuals and nations. She also published books on education, health, and other topics of special significance to the church. Since her death about 50 compilations have been produced, in large part from previously unpublished writings. She also authored several thousand articles which were published in the Review and Herald, Signs of the Times, and other Seventh-day Adventist periodicals. Initially shy and reluctant, Ellen White eventually became a very popular public speaker, not only in the United States, but in Europe and Australia as well. She was much in demand in Adventist meetings and also before non-Adventist audiences, where she was a much-sought-after temperance lecturer. In 1876 she addressed her largest audience—estimated at 20,000—at Groveland, Massachusetts, for more than an hour without a microphone. In her vision of June 6, 1863, Mrs. White was given instruction on such health-related matters as the use of drugs, tobacco, tea, coffee, flesh foods, and the importance of exercise, sunshine, fresh air, and self-control in diet. Her health counsels, based on such visions, have resulted in Adventists’ living approximately seven years longer than the average person in the United States. Ellen White read widely. She found that this helped her in her own writing as she presented the truths revealed to her in vision. Also, the Holy Spirit impressed her at times to draw literary gems from the works of others into her own articles and books. She did not claim infallibility nor did she hold that her writings were equal to Scripture, yet she firmly believed that her visions were of divine origin and that her articles and books were produced under the guidance of the Spirit of God. Basically an evangelist, her primary concern in life was the salvation of souls. Ellen White was a generous, practical Christian. For years she kept bolts of cloth on hand so that if she saw a woman who needed a new dress, she could provide assistance. In Battle Creek she attended auctions and bought items of used furniture, which she stored; then if someone’s home burned or some other calamity befell a family, she was prepared to help. In the days before the church started its retirement plan, if she heard of an older minister in financial straits, she sent a little money to help him meet his emergency needs. For 70 years, until her death on July 16, 1915, Ellen White faithfully delivered the messages God gave her for His people. She never was elected to an office in the church, yet her advice was constantly sought by denominational leaders. Her formal education ended at age nine, yet her messages set in motion the forces that produced the present worldwide Adventist education system, from day-care centers to universities. Though she herself had no medical training, the fruitage of her ministry can be seen in the network of Adventist hospitals, clinics, and medical facilities that circle the earth. And though she was not formally ordained as a gospel minister, she has made an almost unparalleled spiritual impact on the lives of millions, from one end of the earth to the other. Ellen G. White’s books continue to this day to help people find their Savior, accept His pardon for their sins, share this blessing with others, and live expectantly for Jesus' promised soon return.